The immediate sense that arises from reading Popham’s correspondence with Large is a feeling of pity; these emotive letters detailed Popham’s estrangement from his family in Ireland, his exile to America, and his struggles to establish himself as a merchant on this side of the Atlantic. But as historians have become increasingly aware of the ways in which nineteenth-century epistolary networks offered a forum for both the creation and expression of individual identities, it is crucial to read Popham’s highly affective correspondence with some suspicion and ask what precisely was his relationship with Large. While Popham’s letters were written to gain Large’s support, they were more than base begging. In fact, when Popham related his sufferings to Large in such affective terms, he was inviting Large to join him in the sort of commercial friendships that organized mercantile relationships in this period. As transatlantic trade was conducted largely on credit and without institutional protections, bills of exchange and other promissory notes were a key part of the period’s mercantile culture. Reproduced with permission from the Baldwin Collection of Canadiana Manuscript Collection, William Warren Baldwin papers, Toronto Public Library. Popham was wise to write Large for aid. Though the latter’s life has not been examined by historians in any depth, Large’s extant correspondence situates him firmly in the Irish-Protestant diaspora of the late eighteenth and early nineteenth century who tested their fortunes around the British Atlantic world. Large followed the British forces sent to the Caribbean during the upheaval of the French Revolution and attempted to turn a quick profit in sugar, coal, and other goods connected to the slave economy on the contested French colonies of Martinique and St. Lucia during the latter half of the 1790s. Around the turn of the century, he relocated his business interests to Virginia and then moved to New York. He finally settled in Upper Canada, sometime between 1810-1811, where he reaped the advantages from his friendship with his fellow Irishmen in the prominent Willcocks-Baldwin clan. While it is not certain where Popham first made Large’s acquaintance, it appears their connection can also be traced back to Ireland. Through his mother, Popham was a member of the Biggs family, who lived on the same street in Bandon, Cork, as Large’s wife’s family, the Kingstons. Queenston Harbour, 1871, Public Domain via Wikimedia Commons. Popham’s unreserved letters give no hint of such a tenuous connection. In fact, Popham wrote as though he and Large had been lifelong chums. In December, 1825, Popham lamented that he had been unable to visit Upper Canada due to his poor finances. He then cut to the chase: “One object besides the pleasure of your society in visiting Canada is to endeavour to procure some employment for my son who is intended for the Church.” If this were possible, Popham planned to support them both by opening, “[a] small store which I should like to do in your parts where I think with some Cash I could procure some credit.” Here, the spectre of financial need for Popham and his family blended with the affective. This was not unusual; nineteenth-century correspondence often included pleas for assistance from family members that pulled on the ties of affective obligation. But Popham’s proposed friendly visit to Upper Canada contained in it the offer to enter into a commercial friendship through Popham’s requests for information and support that relied on Large’s network in Upper Canada. It appears to have been a prospect Large greeted with hesitation. Though we do not have Large’s reply itself, Popham’s follow-up letter from June 1826 thanked Large directly for the information concerning his son’s prospects in Upper Canada, but made no mention of any information about establishing a store, let alone advancing him the money to do so. Indeed, if Large was willing to assist Popham, there were clearly limits on what he was willing to do for his acquaintance. Perhaps sensing this limit, Popham began his tragic tale in earnest as a way to ingratiate himself to Large. As he recounted his banishment from Ireland by his family and the difficulties of existing on a meager stipend, Popham let slip that his family’s estate was valued at £16,000. The subtle reminders of Popham’s admittedly strained connections to wealth which peppered his “narrative of need” are further evidence of his attempts to entice Large into a commercial friendship. Indeed, in the nineteenth-century mercantile world, business was largely done between trusted friends and family. As Popham reminded Large, “you know without an endorsement the impossibility of getting cash, particularly [from] a stranger.” With these quiet cues, Popham attempted to convince Large that if he went in for a penny now, he stood to make a pound later. When read in this light, Popham’s next letter to Large from Belfast sent in November, 1826 reads as a testimonial of his worthiness as a friend: “[the ship’s captain] took me by the hand and said from the very handsome manner on which my friend Capt. Chase represented me to him he could not think of suffering me to go into the steerage – made me go into his cabin with him.” Popham made clear to Large that he remained a respectable gentlemen connected to a considerable fortune as he countered his family’s opinion of him with accounts of others recognition of his virtues. Wiliam Henry Bartlett and Edward John Roberts, Toronto (1838), Toronto Public Library, Baldwin Collection. Despite his efforts, Large appears to have been impervious to Popham’s pleas and propositions. There is no indication in Popham’s replies that Large ever offered him any material assistance. Yet Popham continued to declare with further gusto that he would emigrate to Upper Canada and settle, “[in] the neighbourhood of so beloved a friend and in case of accomplishing this desirable object I flatter myself that the remainder of our lives will be spent in reciprocal pleasures and advantages.” But the continued lack of financial support that Popham received from Large suggests that not all the “reciprocal pleasures and advantages” Popham proposed were reciprocated. Large denied Popham the “advantage” of his material assistance and was as stingy as those “pretended friends” and family members Popham decried, whose “hearts would not allow them to advance for the purpose a few pounds.” In his final extant letter to Large from 1829, Popham wrote: “I repeatedly mentioned it was my most favourite object, that of ending my days with a friend I so much value … and leave a Country I so much detest.” If Popham was fishing with his flattery for help, Large never bit. Why did Popham never press harder for Large’s material support? After all, as Nancy Christie shows, family members and friends shamed one another to great effect in their letters during this same time period. It may have been that the cultural imperatives of masculine independence prevented Popham from going this far. However, I would argue that Popham’s refusal to accuse Large of parsimony or simply ask directly for aid reinforces what Popham’s affective language might otherwise obscure: Large and Popham were not friends, but two men navigating the complicated mercantile culture of the nineteenth century though a language centered on affect. Their letters are a key reminder that the use of affective language is itself insufficient evidence of an existing intimate relationship. Rather, as a way of distinguishing members of a wider transatlantic community, affective language was invoked to create the very intimate connections it supposed. Reflecting on how those bonds were made and maintained during the nineteenth century serves to better illuminate the highly personal nature that organized transatlantic communities. In short, this reading of Large and Popham’s letters ultimately show yet another way we can think of empire and colonization as intimate affairs. Mike Borsk is a PhD Candidate in History at Queen’s University. After completing his masters research on nineteenth century transatlantic family networks, his doctoral work untangles the relationship between law and land by examining the role surveyors played in the formation of Upper Canada as a settler space within the wider North American context. You can find him on Twitter at @MikeBorsk. Ontario Archives (OA), William Baldwin Family Fonds (WBFF), F 17, Richard Popham to John Large, June 29th, 1826. T.H. Breen, Tobacco Culture: The Mentality of the Great Tidewater Planters on the Eve of Revolution, 2nd ed. (Princeton: Princeton University Press, 2001); Toby L. Ditz. “Formative Ventures: Eighteenth Century Commercial Letters and the Articulation of Experience,” in Epistolary Selves: Letters and Letter-Writers, 1600-1945, ed. Rebecca Earle (London: Routledge Press, 1999). Bandon, County Cork: A Social History of North Main Street and Kilbrogan Hill, Catherine FitzMaurice (Cork: Bandon Genealogical Society, 2015). Elizabeth Jane Errington, Emigrant Worlds and Transatlantic Communities: Migration to Upper Canada in the First Half of the Nineteenth Century (Montreal: McGill-Queen’s University Press, 2007). Nancy Christie, “A ‘Painful Dependence’: Female Begging Letters and the Familial Economy of Obligation,” in Mapping the Margins: The Family and Social Discipline in Canada, 1700–1975, eds. Nancy Christie and Michael Gauvreau (Montreal & Kingston: McGill Queen’s University Press, 2004), 69-102. OA, WBFF, F 17, Richard Popham to John Large, June 29th,1826. OA, WBFF, F 17, Richard Popham to John Large, August 5th,1829. 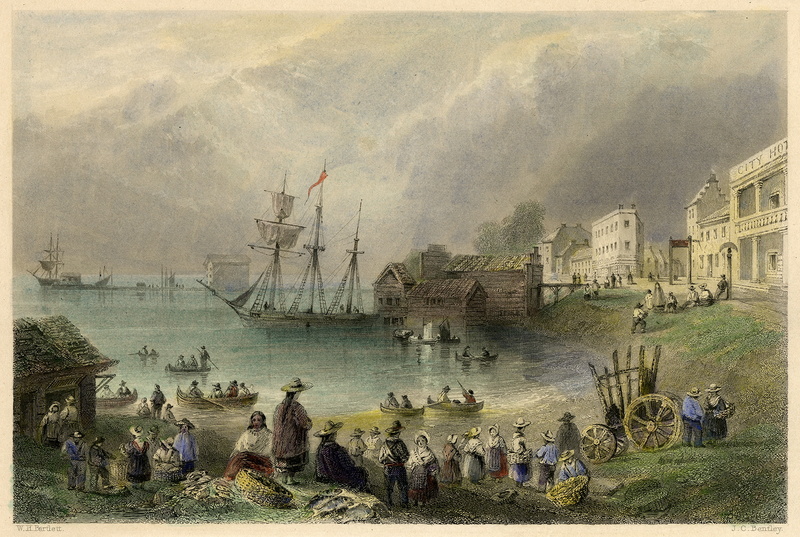 Featured Image: Joseph Clayton Bentley, Fish Market, Toronto (1838), Toronto Public Library, Baldwin Collection.